Nothing is more tragic than a fire. Modern’s main focus is ensuring the homeowner does not endure any additional heartache or headache. 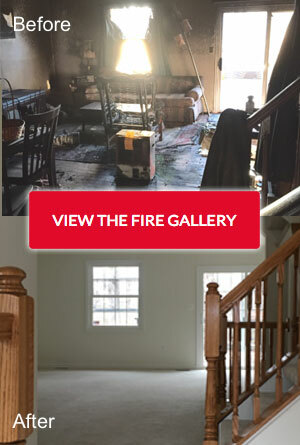 After a fire, we completely take over for the homeowner; from walking the scope of damage with the insurance adjuster, to dispatching our mitigation crews, to guiding the homeowner through the rebuilding process to closing the claim and years after. We treat each customer like family and want to see them back in their home as quickly as possible. We meet customers at all stages after a fire has occurred. We have 24/7 emergency services available and sometimes meet them on scene before the fire is even out. In this situation, our only concern is making sure the homeowner has temporary shelter, clothing, food and anything else they need. We have an entire Victim Assistance Program dedicated to fire victims. Most often, we meet our customers after the fire. The first step is to board-up their home. This is done to prevent anyone from entering the property, protecting the homeowner from any liability claims that could possibly occur. This is especially important as often times the structural integrity of a home is unstable after a fire. Secondly, we board-up the homeowner’s property to protect any precious belongings from being stolen or further damaged from the elements. While most companies specialize in either strictly board-ups or strictly rebuilds, Modern has the capability to do both. We have trained experts who handle major fire losses on a daily basis. You wouldn’t want to work with an average contractor who may not have the experience in handling such a complex claim. Modern can ensure everything damaged is covered in the scope as well as ensuring building codes and the homeowner’s wishes are being followed. The ultimate goal is to get you back in your home in as little time as possible. If you have experienced a fire or know someone who has, contact us with any questions. We understand how complex and confusing such a loss can be and we are happy to lend our expertise and resources.